Scott Rees & Co solicitors are not only committed to helping our clients but also local communities across the North-West. We often undertake sponsorship opportunities with local teams, aspiring athletes, charities and more. As a proud product of Skelmersdale and now Newton-le-Willows, we are always looking to help the local and nearby communities. We are always looking for the right cause to assist with. If you feel your group, team or you as an individual could benefit with Scott Rees & Co’s sponsorship, then don’t hesitate to get in touch with us. Let us know about yourself, the cause you represent and some contact details so that we can get in touch with you. The Skem Men-Aces is a Skelmersdale-based football team for people with learning disabilities. Since being founded in 2009, they have continued to grow in both size and reputation as they have been featured on TV, local radio stations, local newspapers. The Skem Men-Aces’ biggest achievement was taking part at the Special Olympics National Games held in Bath 2013, where they won a silver medal. The Skelmersdale Cricket Club (also known as Skelmersdale CC) was formed in 1981. They are a local cricket club who are affiliated to the Lancashire Cricket Board and are ECB ‘Clubmark’ accredited. The Skelmersdale CC are committed to improving and developing the abilities of their players and have several senior and junior teams. Through our sponsorship, they play on the ground recognised as the Scott Rees Park. In the summer of 2016, a team of Scott Rees & Co representatives attended a charity golf day at the Frodsham golf course to raise over £8,700 for Merseyside’s Willowbrook House. Scott Rees & Co presented a cheque of £500 to the ARROW campaign to block plans to expand the Whitemoss Hazardous Waste Landfill in Skelmersdale. The landfill is an environmental hazard and would provide complications and issues for the locals living here, so we felt we had to do our part to prevent the Whitemoss Hazardous Waste Landfill from going ahead. In 2009, we pledged £500 to support West Lancashire Community High School’s bid to become a ‘Communication and Interaction’ specialist school. We are always looking to help local schools and more projects are welcomed to be brought to our attention. In the past we have been corporate supporters of Liverpool Football Club. We have previously been corporate supporters of Everton Football Club. From 2002-2010, we provided sponsorship to the Skelmersdale Dynamo Rangers youth football teams. We have previously supported Skelmersdale United Football Club. This includes delivering the man of the match awards, advertising on the hoardings on the side of the pitch and giving vocal support at the games during the weekends. We pledged £500 to help fund 21 year old local Rugby League player Daniel Pyke’s place in the Rugby League Student World Cup Championships being held in Brisbane, Australia in 2008 where he represented Ireland. Daniel went on to play in all group games against Wales, France & New Zealand before exiting the tournament in their semi-final match against Greece. In 2006, as part of Sport Aid, we sponsored four young athletes from the North West. Andrew Brown (sailing) from Warrington, Joseph Molyneux (rugby) from Up Holland, Tommy Fleetwood (golf) from Southport and Deane Ashcroft (BMX racing) from Wrightington. We pledged £500 in 2007 towards community safety projects in the Ashurst area of Skelmersdale as part of the Lancashire Partnership Against Crime Scheme. We want to be proud of our local community and taking part in any scheme that makes our local area better is one we want to be involved with. In 2012, we took part in the Santa Dash as part of Text Santa, raising £533.50 in the process. The fun run hosted at many locations around the country enables runners to dress up as Santa Claus to complete a 5 kilometre run through various UK cities for charity. In 2013 we held a dress down day to raise £500 for the Queenscourt Hospice in Southport to support them in their efforts to help victims of cancer. Cancer is a disease that affects us all including some members of our staff. We are always on the lookout for cancer charities in need of our support. 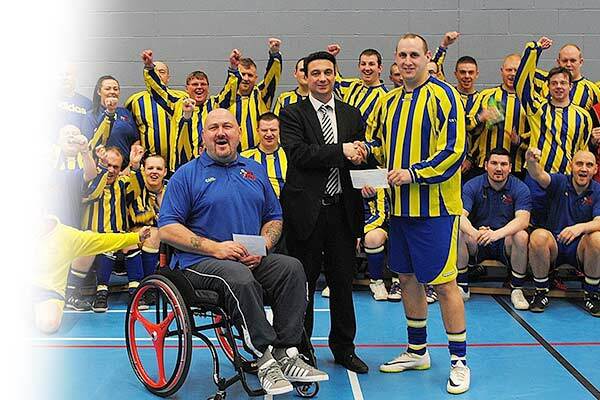 We supported the Joseph Stockton Charity football event in 2012 by donating £250. The event was aimed to raise funds for a local Skelmersdale boy who was suffering from a rare disease named Miller-Dieker syndrome. In 2012 Scott Rees & Co pledged £250 to help the 1st Skelmersdale Scout group refurbish their scout hut. Having served the local community for in excess of 70 years we were more than happy to help see the completion of the refurbishment and how much it helped the young people using it. In 2013, we sponsored the Liverpool Chinese Business Association’s Chinese New Year celebrations. The year of the snake brought good fortune to us as our business went from strength to strength, bringing in a host of successful new employees during the calendar year. Scott Rees & Co trainee Michelle Aindow took part in the Great North Swim to raise money for Wigan & Leigh Hospice; we supported her with a £100 donation. Altogether Michelle was able to raise a fantastic grand total of £1,029 on completion of her swim. In 2015, our Senior Partner Daniel Rees completed his third marathon of the year in Lisbon to help raise money for a new cancer unit in the heart of Liverpool. Raising £3,800 in donations; we were able to contribute to the successful opening of a brand new hospital specialising in treating cancer patients. 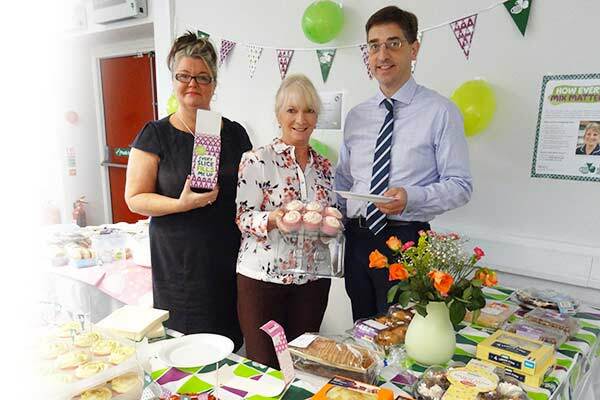 In 2015, for the 3rd year in a row, Scott Rees staff pulled together to produce a “good bake” and not a single soggy bottom to celebrate Macmillan’s “World’s Biggest Coffee Morning”, baking cakes and selling them, raising £210 in 2013, £290 in 2014 and £373 this year. As a supporter of local projects, we were happy to present the Skelmersdale Prize Band in 2015 with £200 towards helping send them to their national finals. Serving the community for long before Scott Rees was established (since 1878 in fact), the band is an integral part of the Skelmersdale community. Founded by one of our own partners Chris Walker (Partner for Catastrophic Injuries), the legal walk began in 2013 to raise money for the provision of legal aid to those that can’t afford it. Thanks to the yearly walk, the North West Legal Support Trust is able to provide grants to those in need all year round. Scott Rees & Co have previously held fundraising events such as raffle tickets, donations for wearing red at work and sweep stakes as we helped raise money towards Comic Relief. In 2013, our combined efforts helped raise £540 for Comic Relief. During November 2013, Scott Rees & Co hosted an internal auction and staff raffle in support of Children in Need to raise a magnificent £535 towards children’s charities across the UK.